Rapidly evolving environmental, technological, social, and business factors are transforming the insurance landscape by sparking new risks or driving change within existing threats. 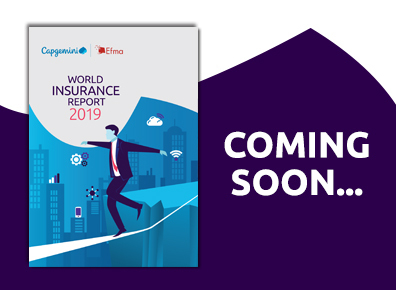 The World Insurance Report (WIR) 2019, published by Capgemini and Efma, explores the impact of macro trends including disruptive environmental phenomena, high tech advances, social and demographic shifts, new medical and health concerns, and a morphing business environment. Technology is key to proactive management of these new high-impact risks and shifting customer expectations. Increasingly, the insurer’s role will progress to include a greater presence in customers’ daily lives as relationships with policyholders are redefined. The insurer of tomorrow will take a holistic approach to customer risk management by acting as a partner and preventer while continuing to be a payer. For details about the World Insurance Report 2019, visit www.worldinsurancereport.com, follow #WIR19, or contact us at insurance@capgemini.com. 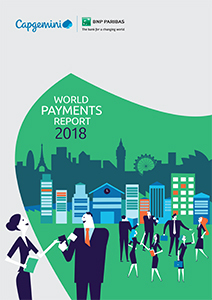 The World Payments Report (WPR) from Capgemini and BNP Paribas is the leading source for data, trends and insights on global and regional non-cash payments, the key regulatory and industry initiatives (KRIIs), and today’s dynamic payments environment. In this 14th edition, the WPR explores how the banking industry is looking to offer new value-added services to customers, including corporate treasurers, with the adoption of a new payments ecosystem. It finds banks have made progress in developing this ecosystem, although not as fast as BigTechs have made quick inroads in the payments space. The WPR 2018 also analyzes emerging technologies such as APIs, Blockchain/DLT and real-time payments that can help banks become anchors of the payments ecosystem. In addition, it introduces an Open Banking Assessment highlighting the state of open banking from a payments perspective across 17 countries. The inaugural World InsurTech Report (WITR) 2018 from Capgemini and Efma explores how InsurTech firms are redefining the Insurance industry with disruptive new business models and innovative and personalized offerings. It also offers insights into the benefits of collaboration between incumbent insurers and InsurTechs, including potentially positioning both as industry frontrunners. However, “effective” collaboration is key. WITR offers a range of empowering strategies to help established insurers and InsurTech firms prepare their organizations for effective collaboration and to understand which characteristics will differentiate winners in the medium-to-long term. As technological advancements and changing customer expectations drive new possibilities and imperatives, InsurTech firms will become the industry’s innovation and R&D hubs and will be catalysts for a growing market and ecosystem. In this digital-first economy, reinvention is the only way forward. Banks have little choice but to be laser-focused on the customer journey. The relentless speed of innovation has resulted in continuous disruption on many fronts, an explosion of new technologies (open APIs, artificial intelligence and blockchain), and soaring consumer expectations. As the World Retail Banking Report 2018 (WRBR) from Capgemini and Efma reveals, the next wave in the industry will bring an ecosystem of banks, BigTechs, FinTech firms, regulators, and developers as well as non-banking firms. The common element is that all these players place the customer at the center of their value proposition. While banks can and should play a central role in this new ecosystem, WRBR 2018 assesses the significant change process all banks will need to undergo in their commercial and operating models in order to remain competitive. The Asia-Pacific Wealth Report 2018 from Capgemini is the industry leading benchmark for tracking the evolution in the number of high net worth individuals’ (HNWIs) and their wealth, as well as investment behaviors and practices in the region. The report explores trends in HNWI population and wealth in Asia-Pacific, and the economic and market drivers of growth in key individual markets. To understand evolving HNWI behaviors and preferences, this year’s report delves into the topics of satisfaction, asset allocation, and personal relationship strength across emerging and developed markets in the region. The APWR also takes a look at HNWI interest in account aggregation. The 2018 edition delves deeper into hybrid advice models and how the potential entry of BigTech firms (Google, Amazon, Alibaba, Tencent, Apple etc.) will impact the industry. The report also discusses the ways firms are responding to potential business model shifts to be prepared for future. Financial Services customers across the globe have collectively raised their voices and their expectations. If they can order books, food, and travel with a few simple clicks on their phone, they now expect no less from their financial services providers. Enter FinTechs. These innovative, agile entrepreneurs have changed the financial services landscape by using mobility and technology to deliver financial products that were traditionally the domain of financial services firms. By doing this they have changed the customer journey for consumers and their institutions. And, the world as traditional firms knew it, changed forever. The World FinTech Report 2018, from Capgemini and LinkedIn, in collaboration with Efma, explores approaches and engagement models traditional firms and FinTechs can adopt for a successful collaboration and assesses the best practices from the industry for finding the right approach. 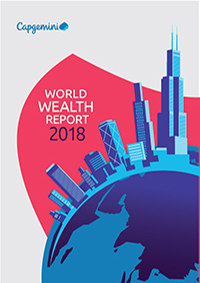 Now in its 22nd year, the World Wealth Report 2018 from Capgemini is the industry’s leading benchmark for tracking high net worth individuals (HNWIs). The report looks at the latest dynamics in HNWI population and wealth growth, as well as in-depth global research on HNWI preferences and behaviors. Such topics include asset allocation, satisfaction levels, personal connections with wealth managers, cryptocurrency preferences, and offshore wealth holdings. To assist wealth management industry executives in making strategic decisions, the 2018 edition builds on last year’s report to dive further into hybrid advice models that blend human and digital interaction. The analysis goes deeper into the potential entry of BigTech firms (Google, Amazon, Alibaba, Tencent, Apple etc.) in the wealth management industry and the response required by incumbent firms. These response areas include evolving their approach to budgeting for transformation and implementing emerging technologies such as Artificial Intelligence, Machine Learning and Open APIs to counteract the BigTech threat.